To help ensure the student experience at UCL is as good as it can be, here are 5 things we're doing to assist with finding study spaces. We're working hard to make the student experience at UCL as good as it can be. As a central London university, space is one of the big issues. Over the last year UCL has invested over £1 million to increase study spaces by 15%. 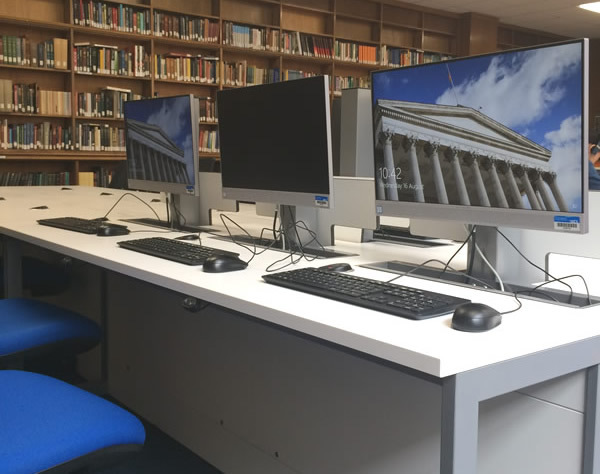 This includes a complete transformation of Great Ormond Street Institute of Child Health Library, a refurbishment of the Science Library ground floor and significant additional spaces have been created in the Institute of Education Library, Cruciform Hub, Main Library and Royal Free Library. As a UCL student you are entitled to use all our libraries (just remember your card to gain access). Some libraries are quieter than others, so please do explore the facilities to find your ideal spot. If you'd like any guidance on which spaces to visit or help finding them just ask one of our library assistants for advice. We know we still need to go further to increase library study space. UCL's New Student Centre is currently under construction on the last piece of undeveloped land on Gordon Street, adjacent to the Bloomsbury Theatre. When complete, this flagship building will provide 1,000 new study spaces for students, and will also accommodate a café, roof terrace, Student Enquiries Centre and a Quiet Contemplation Room. Sample furniture for the centre is currently on display in the Science Library and Students' Union so you can help to create the space you'd like to study in. "The introduction of this new technology will make a big difference. There is an increasing demand for space across the University, and this system will help us to make better use of our space by understanding how it's being used and what type of space is most in demand." In a review last year, library staff found that over 100 desks were left unoccupied for several hours in the Science Library, while at the same time students were looking for a place to study. To make it fairer for everyone, we've introduced a scheme called 'Share the Space', where we ask you to take your belongings with you and vacate the desk if you're going to be away for more than 30 minutes. Term 3 is when space becomes especially busy and UCL Library Services, Estates and the Students' Union are already working on a plan to provide additional 'pop-up' library spaces for the exam period. We'll have more information on this in January. Currently the Main Library, Science Library and Cruciform Hub open 24 hours Monday to Friday. From Easter (over the exam period) they open non-stop. This academic year we're also extending our opening hours so the Main Library will be open every day over the Christmas 'closure period'. The Institute of Education Library and SSEES Library will also open 24 hours from Term 3 over the exam period. Take a look at our web pages for more information about library study spaces.